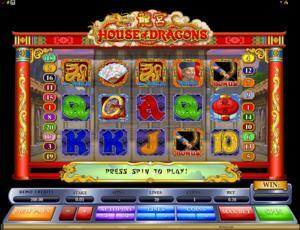 House of Dragons is an online video slot machine game released in August 2012. It is offered exclusively at online casinos powered by Microgaming. This video slot game has 5 reels and 20 pay lines. The theme of House of Dragons is based upon dragons and the Chinese culture, traditions and beliefs. According to the Chinese calendar, 2012 is the Year of the Dragon, which is a perfect theme for a slot game; thus, the House of Dragons was created. Chinese dragons are legendary creatures in Chinese myth and folklore. Such dragons traditionally symbolize strong and auspicious powers, and they are also a symbol of strength, power and good luck. Because of this, the Chinese Emperor often used a dragon as a symbol of his imperial power and strength. Be overwhelmed with the power of the dragon in the House of Dragons online slot game! You will surely love spending some time playing here as the game offers not only 2 wild symbols, but also 2 scatter symbols! Play the Archery Bonus Feature game and gamble your wins, or unlock the Chinese Fan Bonus Feature to get a bonus prize of 2x up to 12x your total bet! Microgaming online slot games are available to players in 2 formats – download and no-download. Whether you like to download their software first or you prefer to play instantly without the need to download, then Microgaming surely has online slot machine games to accommodate your every slot gaming preference. Good thing that House of Dragons is available for instant play, so you do not have to download anything to find out if this game interests you in a way that you would like to spend some real money on it. House of Dragons is created for those with adventurous souls, have a fascination for mystical dragons, and the desire to win some real money while enjoying a round of spins in this slot game. Most online slot players even refer to their game play as a very enjoyable ancient China adventure, especially when they took the chance at gambling their winnings. The House of Dragons online video slot game features scatter wins, two wild symbols (a regular one, and a Wild multiplier symbol), an Archery Bonus Feature game, a Chinese Fan Bonus Feature game, a Gamble Feature game, a maximum coin jackpot of 100,000, and a maximum cash jackpot of $50,000! There is no constant background music you will hear while playing this game. When you spin the reels, traditional Chinese-themed music is played out. When you form winning combinations, music played from a Chinese zither, gongs, and other Chinese musical instruments will fill your ears. The card deck symbols available in the House of Dragons online video slot game are 10, J, Q, K, and Ace, and their font is written with a Chinese calligraphy-like stroke to match the game’s theme. The regular symbols that you will find in House of Dragons are the Chinese lantern and the Feng Shui Chinese coin (coin with a red string). There are 2 Wild Symbols available in the House of Dragons online video slot machine game: the Chinese Man and the Golden Dragon. • Chinese Man wild symbol – acts as a substitute for all other symbols (except for the Golden Dragon wild symbol and the scatter symbols). You are paid varying prize amounts (refer to the Payout table) when you manage to form a winning combination with multiple Chinese Man wild symbols on an enabled pay line. • The Golden Dragon wild symbol is a wild multiplier symbol. Thus, the Golden Dragon wild symbol not only acts as a substitute for all other symbols (except for the Chinese Man wild symbol and the scatter symbols) in order to you help you form winning combinations, but it also can multiply the payout! The Golden Dragon wild symbol doubles (multiplier x2) the payout of any winning combination it completes, as long as it acts as a substitute symbol. You are paid varying prize amounts (refer to the Payout table) when you manage to form a winning combination with multiple Golden Dragon wild symbols on an enabled pay line. Take note that the Golden Dragon wild symbol winning combination payouts are not doubled. There are 2 Scatter symbols available in the House of Dragons online slot game: the Chinese Fan, and the Bow and Arrow Bonus scatter symbols. • Chinese Fan scatter symbol – can be found anywhere on the 5 reels. The scatter symbol is not required to appear in a line (on an enabled pay line) for you to win, and you are able to form winning combinations as long as there are 3 or more Chinese Fan scatter symbols that appear. Your winnings are calculated by multiplying the Chinese Fan scatter symbol combination payout (refer to the Payout table) by the total number of coins you’ve bet. If you manage to get 3 or more Chinese Fan scatter symbols, they will open to reveal a total win of 2x up to 12x your bet! • Bow and Arrow Bonus scatter symbol – can be found anywhere on the 5 reels. If you manage to get 3 or more Bow and Arrow Bonus scatter symbols on an active payline, you will activate the Archery Bonus Feature game. If you manage to get 3 or more Bow and Arrow Bonus scatter symbols on an active pay line, you will activate the Archery Bonus Feature game, wherein you can Gamble or Collect your bonus prize. Shoot targets and you can multiply your bonus up to 4x! To gamble, select one target to shoot at. You will win a bonus multiplier depending on which target the arrow lands. If you click the Collect button to collect your winnings, the Gamble Feature game will end, and you will be returned back to the regular House of Dragons online video slot game. • Chinese Fan Bonus Feature – If you manage to get 3 or more Chinese Fan scatter symbols, they will open to reveal a total win of 2x up to 12x your bet! Up to 5 wins can give you a multiplier bonus of 32x! • Archery Bonus Feature Game – If you manage to get 3 or more Bow and Arrow Bonus scatter symbols on an active pay line, you will activate the Archery Bonus Feature game. In the Archery Bonus Feature game, you are given the chance to Gamble or Collect your bonus prize. In the House of Dragons Archery Range, you can shoot targets and multiply your bonus up to 4x! Gamble or Collect. Select one target to shoot at. Depending on where your arrow lands, you win the bonus multiplier shown on the targets. Once the Archery Bonus Feature game is over, you will be then taken back to the main House of Dragons online slot game, and your winnings from the bonus game will be included to your overall balance. House of Dragons has 5 reels where you may bet on 20 pay lines. The minimum bet is 0.01 and the maximum bet is 0.50 per pay line. You can wager 1 up to 10 coins per pay line bet. Therefore, the maximum bet amount is 100.00 per spin. People who regularly play online casino games naturally love to stay longer on online slot games that have an Autoplay function. Good thing that House of Dragons is furnished with this function! In Microgaming online slot games, they have 2 game modes – Regular mode and Expert mode. You can have the game spin automatically for you with the Autoplay function that can be found by clicking the Expert button (located at the lower left portion of the game screen). After customizing the Autoplay function to your preferences, just click on the Start button, and the game will automatically spin for you while you just sit back, relax, and enjoy playing this Chinese dragon-themed online video slot game!